This selection of large number worksheets is the final set of the series of Number Names worksheets. 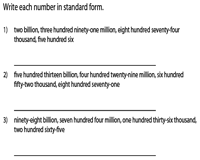 Write the number names or numerals that have been organized into 10-digit (billions), 11-digit (ten billions) and 12-digit (hundred billions) numbers. Click on the 'Download the Complete Set' option to obtain access to all worksheets under this topic. Use the place value table to complete these worksheets that have been divided into 10-digit, 11-digit and 12-digit numbers. 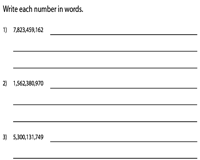 Write the number names for each number displayed on the worksheets. Test your child's expertise in writing the correct number names that range up to one hundred billion in this ensemble of mixed worksheets. Use the answer key to verify your responses. 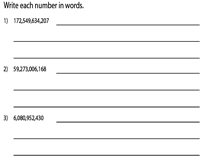 This collection of multi-level number name worksheets is segregated into billion, ten billion and hundred billion. Represent each number name in numeral form. 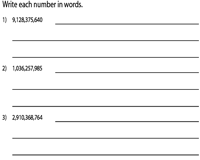 Each worksheet contains eight number names in billions. Write each number word in standard form. 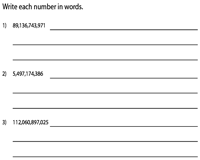 The worksheet contains a mix of 10-digit, 11-digit and 12-digit number names. This gamut of large number worksheets makes for an ideal tool to review a child's aptitude for writing number names and numbers in the billions. The worksheets have been split into three sections to enable smooth downloads. Each worksheet contains two sections. Write number names for the given numerals in the first section. 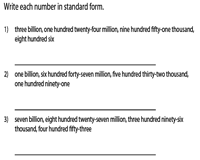 Represent each number word in standard form in the second section.